To say that Jazz has gone a long way, in the 100+ years it’s been around, would be an understatement, but for all its evolution and ever-changing nature, there is a part of the broader jazz spectrum that remains unaltered for decades. Swing music, as championed in the ’30s and ’40s, has been the object of one revival after another, constantly attracting audiences unable to resist the appeal of the the four-beat rhythm. Henry Kovacevic knows this all too well. A swing lover himself, he’s been at the helm of Melbourne’ B# Big Band for 13 years now, preaching the swing gospel to a diverse congregation. 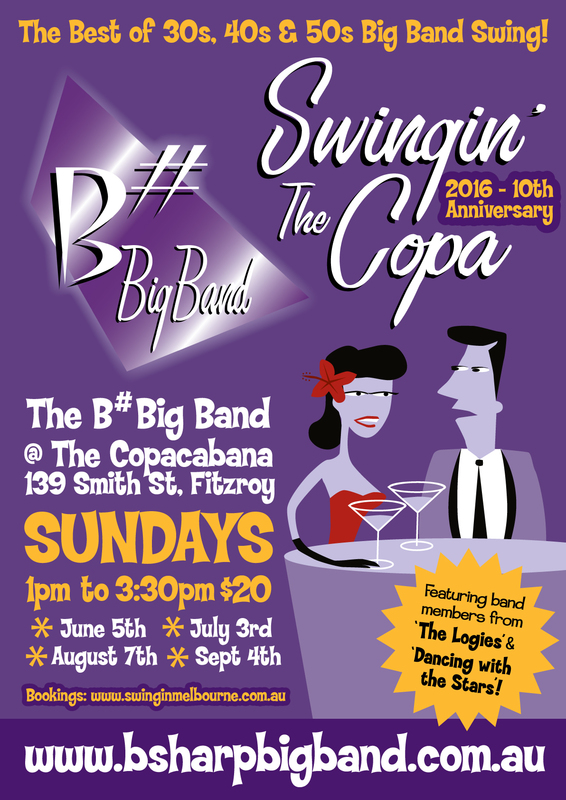 This Sunday, the orchestra is back at the Copacabana, continuing a first-sunday-of-the-month residency. Which is a good opportunity for an interview. AustralianJazz.net: How did the B# Big Band come to be? 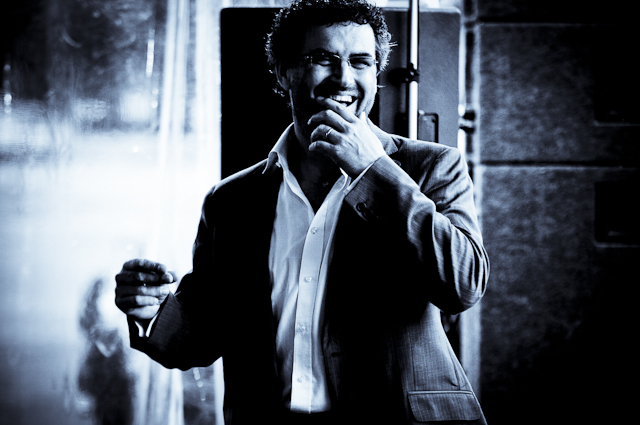 Henry Kovacevic: I was inspired by my school music teacher, Alan Mercer, when I was 15 in Melbourne’s western suburbs. Alan (on the verge of retiring) had previously performed with the BBC band in London, the Air Force band here, and loved sharing his passion for Big Band Swing with me. He planted the seed, which took root, and grew into my own passion, dream and reality. AJN: What was the initial goal? HK: To fill a gap in the market, knowing that there were so many people who loved this music, but rarely got the opportunity to see and hear a swingin’ Big Band. It was also, and still is, very under-represented on the live jazz scene in Melbourne. AJN: How did you make it happen? HK: After developing the concept, while in the twilight of my career as a greeting card salesman for Hallmark Cards, the pilot light was fanned into full flame. I met with an initial group of Melbourne’s highest calibre jazz and session musicians, invited them on board as section leaders, and asked them to pull together sections (rhythm, saxes, trumpets and trombones). As that was happening, I started producing and acquiring aspects of our presentation (music stands, outfits, etc) and sourced high quality arrangements. On September 18th, 2003, it all came together in a launch gig at The Forum Theatre in Melbourne. AJN: What has been the greatest challenge you’ve had to face so far? HK: Our inability to attract media attention (despite ongoing media releases, mailouts and phone calls) to this amazing story. Our success to date has almost solely been spurred on over 13 years by a ground swell of ‘word of mouth’. AJN: What has been the most important reward? HK: The special friendship and respect of so many musicians, clients and fans. AJN: What does being a bandleader feel like? HK: A special kind of joy and privilege – like ‘a fat boy in a chocolate shop’. The best ‘front row seat’ that anyone could have. AJN: What part of the job you’d never imagine? HK: The amazing and continuing arc of acclaim from such a diverse fan base of public and corporate guests – ‘Gen Y to ‘Gen Wartime’ and beyond. AJN: How do you choose the guest vocalists featured in the band’s gigs? HK: On corporate functions, clients choose their preferred vocalists based on ‘samplers’ of each they listen to. On public gigs, like our ‘Swingin’ The Copa’ series, the vocal role is shared across our ever increasing range of vocalists. Many more are knocking on the door, and more ‘B# Love’ will be shared with them as the months and years roll by. AJN: Why not settle with one or two permanent singers? HK: Julie O’Hara, Fiona Thorn, Frank Benedetto and Eugene Hamilton are our main regular and ‘most sought after’ vocalists. But they are often busy with other projects, so our larger group of singers means we can always meet the needs of our clients and fans on the dates we’re booked for. AJN: If you could summon one of the greats of the Big Band era back to life and invite him to join the B#BB, who would that be? HK: The holy trinity of Count Basie, Duke Ellington and Benny Goodman. But if I needed to choose one… toss a three-sided coin! AJN: If you could travel back in time and place, where would you go? HK: Much like Woody Allen’s romanticising of the 1920s in ‘Midnight In Paris’, I’d choose 1938 Carnegie Hall with the Benny Goodman Orchestra; The crucible where Swing music began to burgeon as the pop music of the day. Counter-cultural then, counter-cultural now. AJN: Which part of the swing-era culture would you like to see coming back? HK: The ‘open-heartedness’ of people and communities unaffected by divisive media scapegoating, taunts and propaganda. AJN: How do you explain the perennial appeal of swing and big band music? HK: Big Band Swing evolved during 1930s and ’40s wartime – a time of great oppression. It served to lift the spirits of those at that time, troops and civilians alike. Today too, Big Band Swing shouts an anthem call to all who are weary; Weary of war, worry and woe. So, as B# keeps Big Band Swing alive and live, people from ‘Gen Y to Gen Wartime’ smile, embrace and dance to re-feel their aliveness. And in the depths of their being, the ‘boom, boom, boom’ of today’s ‘modern bombs’ are again drowned by the joy of swing, the joy of life. AJN: What should anyone expect from Sunday’s gig? 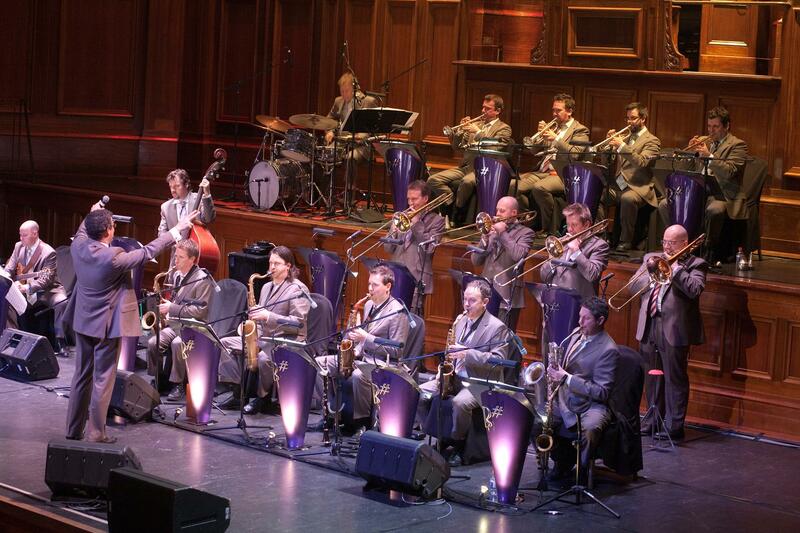 HK: A celebration of the best of ’30s, ’40s and ’50s Big Band Swing, featuring Melbourne’s highest calibre jazz and session musicians, which means we’ll perform these great tunes much like the original bands did, and create similar happiness! AJN: What is the best ‘Father’s Day’ song? Doors Open: 11:50am (for Dance Class attendees) – 12:30pm (for Big Band only attendees). Times: 12pm to 12:45pm – Dance Class. – 1pm to 3:30pm – B# Big Band performance.